Several things happened at once. The ship bucked and shifted, turning on edge like a rollercoaster car. Commander Steve Wilson cursed, slamming his head into the bulkhead with a slap. The lights dimmed, turning an angry red, and sirens began wailing a modulated electronic scream. Communications Officer Svetza Romanov reacted first. In the low gravity, everything moved, following continuous shifting force lines. She transited the long cylindrical module in seconds, pushing aside the growing debris. Her corn-colored hair puffed to form a halo, like a lion’s mane, on her head. Svetza smashed her palm against the emergency shutoff, rebounding from the bulkhead with a thud. The cabin quieted, except for a soft whistle. Loose objects continued to flow in its direction. Svetza sighed, and the gentle rotational spin imparted by her movements sent her into a slow motion somersault. Air currents pressed the blue mission jumpsuit against her torso like a lover’s caress. Two dozen national flags blazed across its back. “Artemis! This is Mission Control!” A frantic female voice blared from the cabin speakers. “We show reds across the board. What’s happening?” The words came quick like gunfire, betraying a distinctive southern twang. “This is Svetza Romanov.” Svetza’s slim fingered hand created a furrow in her hair, pressing the Comm stud near her ear. She read stats from a touch screen, tapping multiple display pages. The bar graph indicators winked red. A ships schematic also blinked amber in several sections, signaling some section or sub-functions required attention. Bai Cheng, People’s Republic representative and mission tech specialist, appeared at her side, examining the readouts. “Air pressure’s dropping.” He said, pointing to a flashing point near the storage locker diagram. “Steven,” Svetza’s slight, accented voice, glided across the cabin in a gasp. Steve Wilson floated, prone, in the cabin’s center. She abandoned the command computer and swam with quick agile movements towards his body. Stubby hair intermingled with perspiration, creating a grey-black thatch across his brown scalp. His arms waved in lazy circles, floating on suspended air currents. Svetza, also their medic, represented Russian friendship, a counterpoint to the tensions between the two nations during the original landing. She raised her hands, stopping Steven’s body from turning in the air circulator’s currents. Her feet found purchase against the bulkhead, and delicate slippered feet pushed them both towards the medical bay. “How is he?” Bai floated closer. She manipulated Steven’s body into a med-web, hooking his floating arms and legs into its straps. Svetza turned in time to see the young man’s smooth pale fingers grip a foam bumper separating the compartments. He halted his forward momentum with a foot planted at the right moment. Good space experience. She nodded. He smiled. An elbow twist and arm squeeze completed his turn. His green eyes twinkled, and his close-cropped straight black hair glistened like onyx in the stark cobalt halogens. “Good to hear, you worried me.” In the silent seconds following, they both heard a thin reedy whistle, like a boiling kettle. Bai propelled himself towards the maintenance cabinets using rapid hand movements, following the noise. His face locked in concentration and his arms made stabbing motions in the air. “We’ve been holed,” he shouted, hovering near a sparkling, dancing debris pile, which continued to multiple as he watched. “How? Your scientists told me it could not happen. The ship uses…” She paused. Bai rummaged in the supply kits. “It uses three-layered construction,” he finished. “An inner Carbon-Fiber film lines our walls. A thin aluminum layer separates a two-part epoxy. If a puncture occurred in the titanium outer shell, the other epoxy layers make contact, foam and harden, sealing the leak. He watched Svetza. She hooked the Commander to a med-comp, attaching sensor pods to his temples and chest. “His vital signs are good.” Svetza pirouetted with a hand on the bulkhead, and drifted towards him. “The foam-steel should seal anything.” Bai retrieved a grid marker, and sprayed a long aerosol stream towards the pressure vortex. Vacuum sucked with violent force at the expelling orange gas cloud. It swirled to coalesce into a hazy point, creating a ragged bull’s eye on the hull. “Got you!” Bai shouted in triumph, pulling a Quick-glue flexible fiberglass patch from the spacesuit repair kit. Removing the paper backing, he floated with care into the tiny maelstrom, and maneuvered it into place. The hissing stopped. The patch puckered and the fiberglass dimpled inward, but held. Bai turned, floating back to the ship’s computer. The red cabin lights returned to normal. The noise died. He heard a frantic voice on the radio, calling, low and faint. Bai adjusted the volume, resetting the emergency tone reduction. “Bai Cheng to Mission Control.” He tapped the tiny Comm-Unit earpiece, and waited the expected seconds for radio signals to reach Earth and return. “Bai, what’s going on?” Relief filled the sensual female voice radiating from the cabin speakers. “The camera feeds went dead right after you reported trouble. Everything is coming back online.” Her soft southern accent made Bai smile. “Copy,” mission control said. “We confirm internal pressure returning to normal.” Background noise and static filled the speakers. “Net-Fan’s follow a subject with obsession, setting their searchers and preference monitors to scrape everything. Aren’t they the same in Russia?” Steve commented. She nodded. “Obsessive,” she muttered. Bai floated next to her. “They told you everything we do and say is broadcast in a continuous feed, right?” She nodded. Svetza put a hand to her mouth. Her face grew pale. “You mean everyone…? I thought, the scientific community…” She stopped, scanned the cabin, and attempted to tie back her loose hair. “How is the air?” Mission Control asked with short crisp syllables. “Information received.” Mission Control said, her voice trailing into nothingness. “What do you think happens now?” Svetza asked. “We wait,” Bai replied. “But given this mission’s importance, I hope they don’t scrub us. I listened to the American President’s speech in college. I attended the University of Massachusetts, foreign exchange.” He smiled. “This president’s dialogue copied President Kennedy’s 1961 exploration and discovery platform,” Bai said, sliding closer. “Why not? It’s a brilliant plan.” Wilson’s voice took them both by surprise. “Commander,” Svetza rotated, bringing the aging Wilson into view. “How do you feel?” She grabbed his wrist checking his pulse and sending them both spinning. “…this nation should commit itself to achieving the goal, before this decade is out, of landing a man on the moon and returning him safely to Earth.” The current president’s inaugural speech drifted from the speakers. “Its space madness, or a concussion,” Bai joked, pivoting and fishtailing away from his crewmates. “Very funny.” Steve launched a water bulb on a trajectory, sending it careening off the bulkhead. Bai caught it in his palm. “Don’t let Mission Control hear, or they’ll scrub the mission for sure.” He rotated in the air circulator’s currents with slow deliberate movements. “Great.” Steve gave an exaggerated sigh. “OK Mission Control, what are you going to do to me?” He smiled, sailing towards the module bay, and the video equipment, his face expanding to fill the nearby monitor. “Stand by.” The radio crackled after a delay. “Artemis.” The word held finality. “Artemis the abort command has been given for this mission. We repeat, the mission is a scrub.” Mission Control’s voice softened. “I’m sorry,” she added. Their faces sunk. They drifted apart with slow languid movements, each retreating to a separate area. “So close,” Bai muttered. “The celebration.” He swam to their precious cargo. He lifted the specially designed champagne bottle. “You beautiful thing. 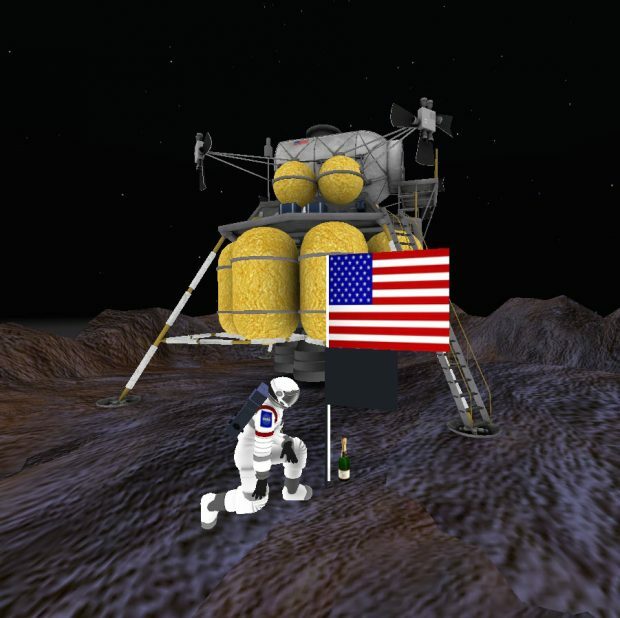 I would have given you a good home at the original 1969 lunar landing site.” Bai crooned. “Man will revisit the moon, but the fiftieth anniversary will never happen again.” Steve added. “Would anyone mind if I drank this?” Bai asked the air. “I would hate to waste such a fine champagne.” He smiled, trying to lift the mood with his usual wry humor. It didn’t work. Bai moved back to the presentation box. The lustrous bronze case shone in the fluorescents. He slid back the bottle like a sleeping baby. “It is beautiful,” he said. 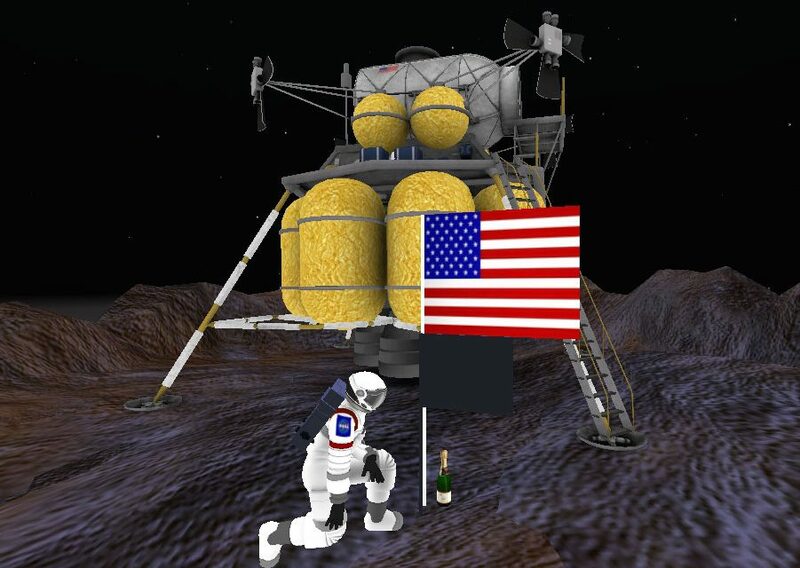 “All shiny silver, with the red white and blue NASA label emblazoned across its front. Bai examined it in minute detail. Bai nodded, rotating the bottle, displaying its thin white stopper. “The cork’s polymerized rubber will retain its shape and integrity within a wide temperature range. Drinkable today or millennia from now,” Steve said laughing. “Hey, ground control, how do I get it opened?” Bai asked, trying to twist off the stopper. He fiddled with the cork for a long time, longer than the normal communication’s lag. “Mission Control to Artemis, come in Artemis.” The radio chirped and twittered. “Go for Artemis,” Steven replied. “Hold the celebration. We’re checking something. Bai glanced sideways at the bottle, putting it back in the case. “You won’t believe this.” Mission Control chuckled. “But we found a way to continue. Well,” she paused. “We didn’t, a Nef suggested it.” Her voice came quick, with a lilt. She let slip a stifled laugh. He tapped his earpiece. “Mission Control, could you tell our Russian commander how many Nefs are following these broadcasts? “I don’t believe it,” Svetza said in Russian. “So many.” Her mouth opened, forming an oval. Her arms made their own tiny movements. “So, what’s the idea?” Both Bai and Steve said at the same time. They passed a gaze around, mouths open. “Yes you can. The champagne bottle’s cork.” Her voice bubbled with laughter. Their faces remained passive, each unwilling to face the camera mounted below the main monitor, uncomfortable with the live feeds. “It won’t work,” Steve said, pausing. “Oh, and our Nef savior,” she paused longer than distance would suggest. “This genius is a twelve year old Nigerian girl.” A small noise escaped the radio speaker—a laugh. The crew all smiled. Bai opened his mouth, but closed it without saying a word. “Yes, if we get back,” Bai laughed. “What do we do?” Svetza asked. “What’s this we stuff, Commander?” Bai said smiling. “You are in no shape for a walk, and our other commander is not EVA certified. I get to do it.” He drifted towards the landing module, and the single light extra vehicular activity suit. 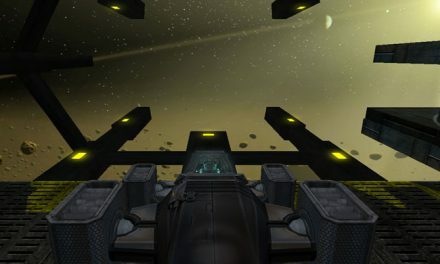 Bai’s helmet light flashed, creating dazzling reflections on a grayish-green crystalline landscape, towers projecting from the ship. “We can see it,” Steve replied. Bai pulled the tiniest fragile epoxy spire. It broke away from the hull, and went spinning into the blackness. “Careful, you don’t create more problems later,” Steve said. “The fragment’s relative velocity is a match for ours, so it should follow us in.” Bai returned, but tried to keep from breaking more resin towers. An orange halo signaled the breach’s location. It shone in his helmet light, a circular blight amidst outrageous beauty. Bai maneuvered close, and fumbled in his waist pack. Removing the composite cork, he compared it to the opening. “It’s too big,” he muttered. “I’ll have to shave a piece from the stopper.” His gloved hands fumbled as he performed the operation, but managed to reduce the edges of the cork before placing it back into the depression. Bracing his palm against the stopper, he pushed. It slid into the void, completing the seal. Bai laughed a short clipped bark. “You won’t believe this, but my glove’s stuck to the hull.” He said in one huge exhale. Silence and static filled the radio waves. A high-pitched, nasal twitter rang in Bai’s ear, followed by a lower baritone laugh growing to fill his suit with ringing laughter. “Yes, very funny.” Bai’s voice sighed. He laughed also. “This is Mission Control. Artemis, do you read?” The laughter cut off. “Yes, Mission Control,” Steve replied. Mission Control’s voice became calm and precise. “Bai, withdraw your arm into the EVA suit and close the wrist ring. Next, disconnect the gauntlet. The suit’s seal will last long enough to get you back inside, provided you didn’t glue any other parts to the hull,” she laughed. “Aye, Mission Control, copy,” Bai, contrite and subdued, replied. He followed the direction, pausing as he turned to leave. His abandoned gauntlet swayed with an eerie gesture, mimicking life in his flashlight’s beam. It resembled a disembodied hand held the patch in place. “Neil Armstrong’s ghost,” he whispered. “One small step for a man, one giant leap for mankind,” Bai said, stepping onto the lunar soil. Fifty years to the minute, July 11, 2019. They agreed to cut the mission short, given the circumstances. After the landing speech, and the equipment setup, they began. Bai carried the champagne container from the lander, keeping it balanced in his arms. His path paralleled the fifty-year-old footprints, still stark and fresh. He rested the ornate case at the Apollo 11 lander’s base. Bai bent to replant the fallen American flag at the landers base. Unfurling a new standard, one with all the world’s flags emblazoned on it. He attached this below the now plain white plastic original flag, and placed an engraved plaque at its base. A hand written note he placed next to this. Bai stepped towards his own lander, and paused. Turning one last time, he saluted the flags, using his left hand. Glancing at the sealed wrist ring on his right hand, he shook his head. Exhaust from the lander’s jets pushed the paper from its perch, and flipped it onto the surface. An inscription in neat formal penmanship, with a Cyrillic tinge, glowed in the bluish earthlight. Dean N. D’Amico is new to the fiction market. The author has previously been published for a speculative fiction piece, co-authored with his twin brother D. A. D’Amico, titled “One Slow Trigger Day.” Dean N. D’Amico is a native of Boston Massachusetts, currently residing in the Washington D.C. region. 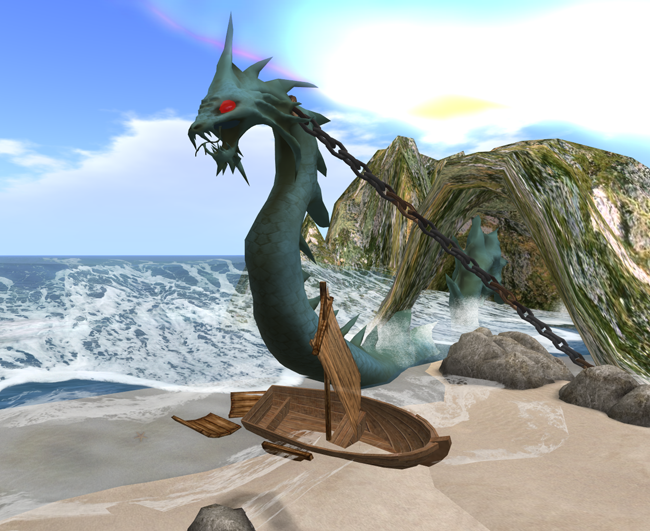 Dean is currently involved with the Merrimack Valley Speculative fiction Writers group to explore all the realms of the possible and improbable.